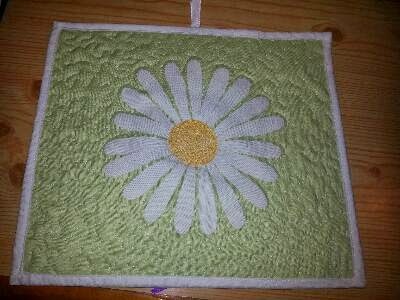 My friend was feeling a bit unwell today, so I made her this happy little daisy wall hanging. I used bondaweb for the petals and middle, then quilted a small stipple pattern all over. Then just quilted the middle bit over and over. That was very sweet of you! I hope it brightened her day. Big log cabin - finished. WiPs Wednesday - big scrappy log cabin. WiPS Wednesday - Scrappy back and wall hanging.